Africa is growing fast but transforming slowly. This is the message of the 2014 African Transformation Report , launched last week by the African Center for Economic Transformation (ACET). The report addresses a worry on the minds of many: in spite of impressive growth, the structure of most sub-Saharan African economies has evolved little in the past 40 years, with a poorly diversified export base, limited industrialization and technological progress, and a large informal economy whose economic potential remains mostly overlooked. In many African economies, manufacturing—the sector that has led rapid development in East Asia—is declining as a share of GDP. The worry is that without a major transformation Africa’s recent growth may soon run out of steam. The report argues that for growth to continue, Africa needs to invest in “DEPTH”–diversification, export competitiveness, productivity, and technological upgrading, all for the purposes of human well-being. The African Transformation Report contributes in a pragmatic and detailed way to a new narrative for Africa. Gone is the continent of poverty and desperation, and in its place is a continent of promise and opportunity—but only if economic transformation takes place. In building the new narrative, the report follows others: the African Union’s Agenda 2063 , the African Development Bank’s long-term strategy , the UN Economic Commission for Africa’s 2013 report , multiple recent IMF papers , and UNCTAD’s 2012 report  on structural transformation and sustainable development in Africa. What the ACET report does better than most is provide a concrete roadmap to maneuver through the individual components of such a transformation, based on a three-year research program covering 15 sub-Saharan countries. The report reinforces these case studies with a summary index of transformation, bringing the power of focused measurement and transparent data to what is otherwise an overwhelming landscape. Navigating structural transformation. 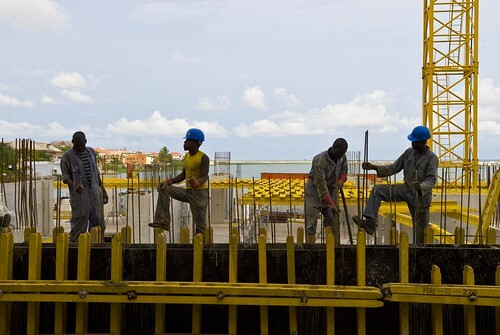 The best path for structural change in Africa is tricky to identify. Recent rapid growth is quite unusual, compared to what happened elsewhere. As outlined in a blog post  by Dani Rodrik and evidenced in multiple academic papers (see for instance Rodrik and McMillan 2011  and De Vries, Timmers and de Vries  2013), African workers moving out of agriculture have typically bypassed manufacturing and gone straight into services—sub-Saharan Africa is actually less industrialized today than it was in the 1980s. What makes it worse is that these services are often low-productivity and informal. The ACET report takes a balanced approach, calling for Africa’s entrance into labor-intensive manufacturing as well as for greater productivity growth in agriculture (or agro-processing), upgrading the agricultural supply chain and developing tourism. The report also provides suggestions on how to better optimize extractive resources, similar to the Africa Progress Panel’s 2013 report . Managing the youth opportunity. By mid-century, sub-Saharan Africa’s workforce will be larger and younger than either India’s or China’s. The needed skills agenda is far broader than the traditional focus on access to and quality of basic education. It also includes vocational training in relevant industries, training of informal workers, and improving technological skills. These recommendations are closely aligned with the approach of the Global Competitiveness Report 2013–2014 , which develops a model of stages of development based on levels of innovation rather than on the traditional agricultural / manufacturing / services classification. Achieving growth with DEPTH is far from an easy task. Successful DEPTH would require wide-ranging policy reforms, and the tackling of cross-cutting issues such as regulation, business incentives and control of corruption. Such an effort would have to be a whole-of-government exercise that produced a strong national vision and strategy, a clear plan for coordination of different agencies and meaningful engagement with non-government stakeholders. It would also need a focus on implementation. As the High-Level Panel’s report on the post-2015 agenda  noted, transformations need to be structured and measured. ACET’s 2014 report on a clear and well-informed set of transformational metrics starts this process and lays down a baseline for some African economies. Africa’s remaining economies should also be encouraged and assisted to produce the necessary statistical information. What has been started is a healthy debate on African economic transformation that goes beyond the broad generalizations of inclusive growth to a more focused set of priorities that can be used to shape African development strategies and their collective position in the post-2015 negotiations.